And The Winner Of The Kurgo Loft Dog Jacket Is...! 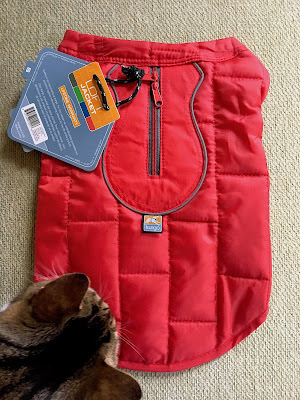 We're excited to announce that Rafflecopter via Random.org has chosen the lucky winner of our Kurgo Loft Dog Jacket giveaway! Let's all put our paws together in a round of applause for Pamela! This jacket is for her newly adopted pug—congrats to you, Pamela, both on your adoption and your new doggy jacket! And thanks to all who took the time to enter. We appreciate your support! Thanks a lot for sharing this with all of us, I like it and we can communicate. app keywords can boost app ranking. I need to spend some time learning much more or understanding more. Thanks for magnificent info I was looking for this information for my mission. Here are working a Doctor’s team for you whose can provide you all knowledgeable article about health. Be bold and use fake acrylic pearl beads that aren’t all of uniform sizes and styles. Silver jewellery is also extra recession proof than gold. Thanks to my father who stated to me about this weblog, this webpage is truly amazing. Hi it's me, I am also visiting this site regularly, this web site is genuinely pleasant and the visitors are really sharing pleasant thoughts. Here are working a Doctorâ€™s team for you whose can provide you all knowledgeable article about health. for the reason that this moment i am reading this enormous informative post here at my residence.